Environmental assessment (EA) is a multi-faceted and multi-stakeholder process involving organizations and individuals within primary industries, consulting firms, engineering service companies, governments and the general public. A good environmental assessment is strategic, rational, expansive, inter-disciplinary, communicative, consultative, integrative and defensible. Each stakeholder’s role is key for the evolution of a project. EA processes comprehend a wide range of responsibilities. 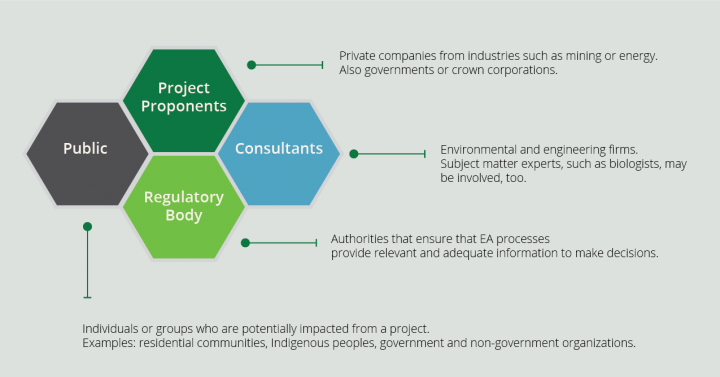 Some stakeholder groups, such as EA specialists and governments, work full time on projects; others, such as project owners, scientists and non-governmental organizations specialized in environmental matters, get involved at different stages of the process. Abilities and experience from other professional backgrounds are also actively involved in the environmental assessment process. Biologists, foresters, policy and strategic analysts, project managers, land use planners, to name a few, work together to provide input and guide projects. The environmental assessment process requires consideration of the social, cultural, and community impacts. Therefore, workers from education, law, and social, community and government services are actively involved. Social scientists in particular are gaining more relevance because of the input they can provide on the choices that individuals have made throughout history. Archeology, for example, can help researchers understand climate change. Professionals in this field of practice have long studied the impact of natural disasters. Environmental assessment and social sciences are more interconnected nowadays. 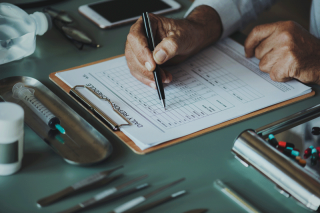 Demand for historians anthropologists, archeologists, among others, is expected to increase, giving the EA process even more diverse perspectives. Learn more about roles and occupations in the environmental assessment process.